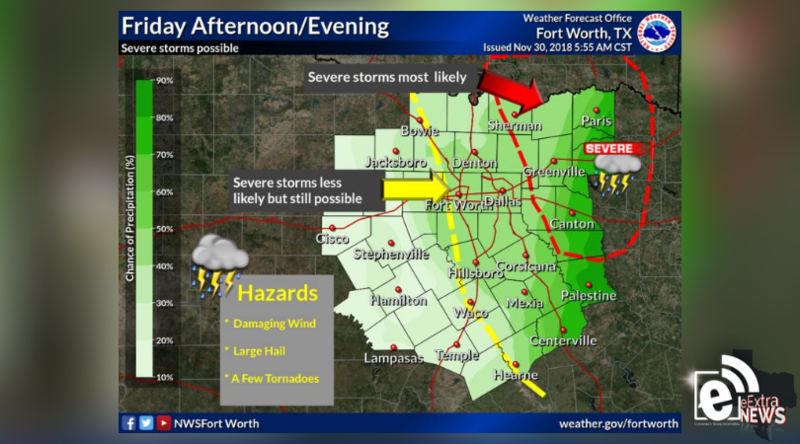 There is a risk of severe thunderstorms from late afternoon Friday through Friday evening across the red shaded area as a strong upper-level storm system moves through. If storms develop along the yellow highlighted area, some could be strong to severe. The primary hazards will be damaging winds, large hail, and isolated tornadoes with the greatest risk near the Paris and Greenville areas. Saturday will be a warm, dry, and breezy day across the region behind Friday’s storm system. Highs will be in the low to mid-70s with breezy west winds of 15 to 20 mph with some gusts to 30 mph. 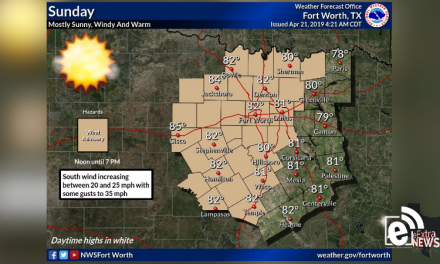 The combination of breezy winds, warm temperatures, and low relative humidity values will result in an elevated grass fire danger on Saturday, mostly along and west of I-35. Locales east of I-35 that do not receive much rainfall from Friday evening’s system may also experience elevated fire weather conditions on Saturday.